A quick update to the WestJet Rewards promotion we brought to you earlier this week. We posed the question to WestJet to see what happens if you mix and match fare classes on the promotion. "If you book one econo fare, then a plus fare, then a econo fare etc. how will the bonus be awarded? .... Say you fly your first 2 flights in Plus you’ll get 20wsd per flight, but your third flight is Econo, do you get 10wsd since its your first econo fare or do you get 20wsd since its your third flight? Then if you go back to Plus for the 4th flight will it be 40wsd or 50wsd?" "You can mix and match the fare class and it will still count as an eligible flight for the flight count each time. So per your example. If they fly first 2 flights in Plus, they will receive 20 WSD for each one, third flight as Econo will earn 20 WSD, 4th flight as Plus will earn 50 WSD. J It’s a win, win, win!" This is great news to know that you don't 'drop' down to a lower bonus when you book into a new fare class! 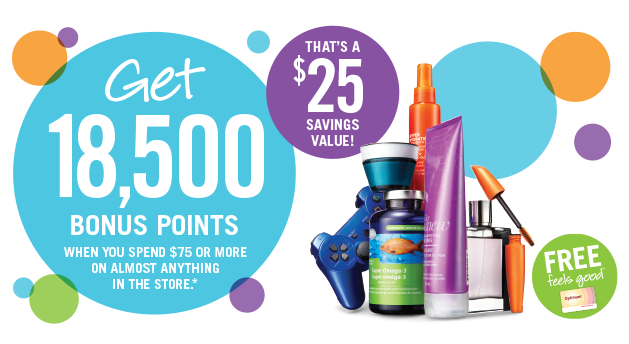 Shoppers Drug Mart is once again sending out big bonuses for shopping tomorrow. We got an 18,500 bonus point offer for spending $75 or more, it may be different for you. You can print out the coupon we got here. Earn – Starting today, members can earn 250 Aeroplan Miles for each eligible rental with Budget at participating locations on- and off-airport in Canada, the United States and abroad. Redeem – Members can now use their miles to get Budget rental certificates worth $50 or $100 on aeroplan.com. Soon, members will also be able to redeem Aeroplan Miles for Budget car rentals for their choice of date and destination and will be able to earn 100 miles every time they do so. Aeroplan is sending out emails to select members offering bonus miles for purchases at ESSO. We received it and you should check your inbox as well to see if you were targeted! More Rewards has lost Canadian Direct Insurance as a partner. Too bad as this program needs all the partners it can get to become the coalition program they want to be! Starwood Sunsational savings offers a free night, up to a $200 resort credit and a room upgrade for stays at Starwood Resorts in the Americas! Find out more here.